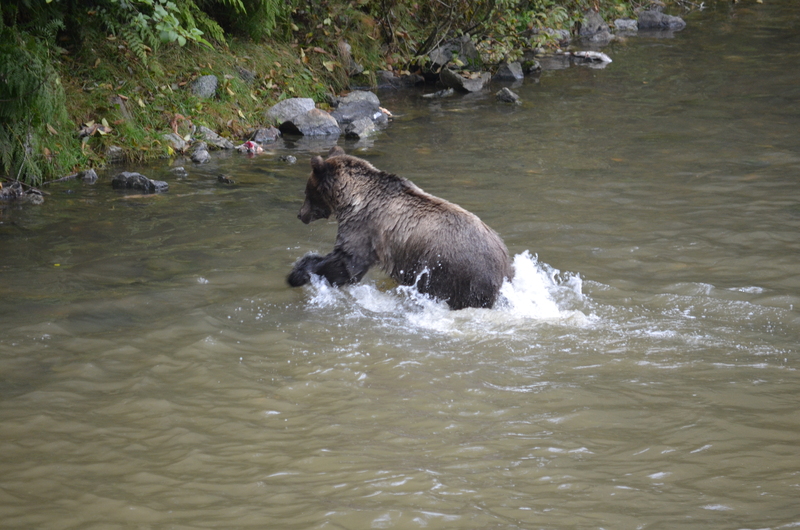 Running after salmon in deep water does not seem to be a good technique to catch salmon but the size of the bear indicates success and that is what matters. 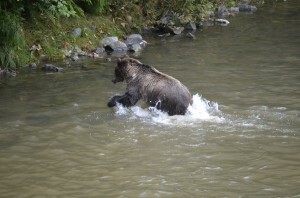 Every grizzly viewed from the stand on the Glendale River seems to have its own fishing style and in the end all that matters is if the grizzly is able to catch enough salmon to fatten for hibernation. This particular grizzly bear is five years old so the technique works. These grizzly bear siblings seem to be old enough to fish on their own but they appear to be waiting for something to happen. 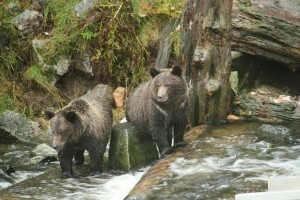 It could be the lack of salmon in the river or that other larger dominant bears have moved then to the sidelines. It could be perspective on my part in that when you do not have another bear use for size comparison maybe they are just very fat two year olds waiting for mother to provide another meal. However at two they should be fishing because next year they would normally be on their own. At times the cubs stay with mother more than two years and if she is not pregnant cubs may stay with their mother for four years.